On August 18th I had the pleasure to participate in Aalto University’s annual Make it Digital! event. Having visited the event already last year I greatly enjoyed both the event’s and the university’s focus on the Internet of Things – its impact on transforming business models, enhancing customer centricity, and the application of service design were the themes which I was looking forward to this year. Aalto has clearly understood that digitalisation is the way forward, with more than 100 professors being involved in the subject and ICT in general, and good ties that bring students and researchers together with relevent businesses. This year’s keynote presentation by Dr. Martin Curly, Professor and Former Director of Intel Labs Europe, provided an overview of what it means to make everything digital. He shed light on three colliding key mega trends the world is seeing right now: Digital transformation, mass collaboration, and sustainability. He emphasized that industries which were established and shaped during over a century are now going to be re-architected in just under one decade by these trends and the new business models they make possible. Looking at digital transformation, powered by the Internet of Things (IoT), businesses switch from manufacturing and selling products to offering intelligent services to their customers. The IoT further means that products are not just physical objects anymore. They also have a digital side which is actually much more important than the mere physical object. The digital counterpart, enabled by IoT platforms, collects, stores, analyses and controls all kinds of information coming from the object, its environment and how it is being used by its owner. This technological leap enables mass collaboration: people to people, people to machines, machines to people, and machines to machines. It brings a major change in our interaction with everyone and everything. Prototypes are essential for many design processes. There are prototypes, and experience prototypes. While a prototype aims at building the thing right, an experience prototype aims at building the right thing. From product design point of view, experience prototypes can be created as rapidly as within hours, whereas prototypes usually require weeks to be completed. 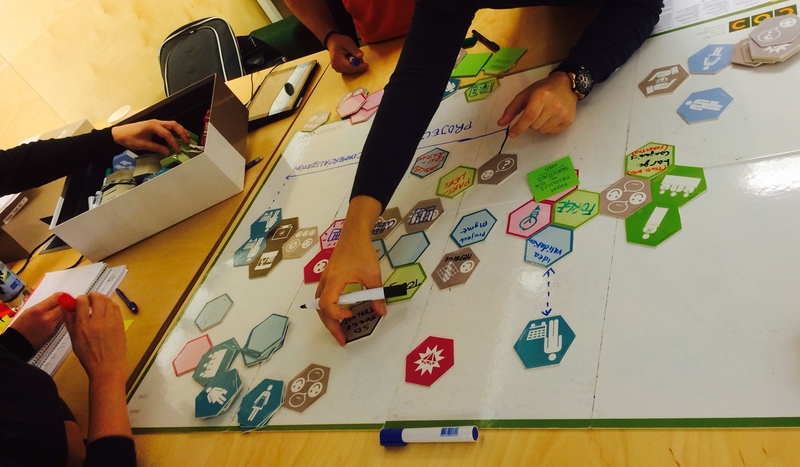 Experience prototype is also a great tool for service designers when new services are to be developed and tested, especially when physical products are part of them. Focusing on video prototypes, this year’s Interaction conference offered a workshop “Rapid Video Prototyping for Connected Products” which I attended on March 1, 2016. Connected products become increasingly important in our surroundings and they will help to add new service elements to traditional products, or to entirely transform products into services. The workshop had teams developing their own video prototype within an hour. The team I was part of got the task to prototype a digital fishing rod. None of the team members were in any way familiar with fishing, which made us go for developing a fishing rod designed for beginners. After drawing a quick storyboard what the day of a fresh fisherman would look like, we moved on to deciding what our digital fishing rod should do and how. We decided that we wanted to incorporate all the digital elements to the rod itself and to build in a small screen to it, comparable to the kind of screen simple fitness wearables have. Short text pieces and color-coding would be used to let the fisher know where the fish was and how to get it. We neglected technical details like what sensors would be used to detect fish in a lake or river and where those would be located. This helped to first think limitless out of the box about what would be useful for someone who is new to fishing. Furthermore, starting out with plain imagination to develop a new service/product would later on provide foundations for actual technical specifications. The next step was to create the cardboard prototype for the fishing rod. Once that was built, we moved ahead and filmed our video that showcases its functions. The video was shot straight through Instagram – which came with the limit that the video could not be longer than 15 seconds. Using the “stop trick” we paused the video to change elements on the fishing rod and continued filming with the new settings in place. Like this, the ready video showed how the color coding on the rod’s screen changed when fish were detected and how the screen gave brief commands like “use this bait”, “throw 20m left”, etc. Rapid video prototypes are great for showcasing all functionalities of the actual service/product and therefore are and therefore a potent way to communicate ideas in an easily understandable way. They can be used to convince investors, to test the desirability of what you’re developing, to articulate a joint vision, to define design requirements and to iterate and refine the service/product design. They deliver many rough but powerful answers, with little cost and time. Some of the workshop videos can be found on Instagram with the hashtag #IxDPrototyping. While navigating through our increasingly digital world, we desire smooth journeys and perhaps a few moments of delight. Our digital UX experiences currently range from visiting websites, making online purchases, using all kinds of apps on our phones and wearables around our wrists, to smart televisions and inbuilt car navigation systems. Over the next few years, technologies like gesture, eye, head and full body tracking, brain-computer interfaces, personalised interfaces, and other new kinds of both implicit and explicit interfaces will add new elements to our digitally powered, everyday lives. UX researchers make use of our behaviour data collected through interaction with these new technologies to offer services and products to us that really meet our individual wants and needs. However, transparency, e.g. how and by whom the data is used, is highly important or otherwise trust might be lost forever. When designing digital environments one should first of all understand the digital media space. Part of this space is the content (what do we offer to our customers), the form (how do we offer it), the person (to whom) and the context in which the interaction takes place. Depending on your own UX research one element might be in stronger focus than the others, but all of them should be considered when designing new or improving existing digital user experiences. Designing for everyone is close to impossible. Therefore, you first need to know who your desired main audience is, and then get to know their personal preferences and, as well as possible, also their individual differences. When conducting digital UX research, there are elements that can be measured. Those include observable behaviours, users’ attitudes, beliefs, thoughts and intentions, as well as patterns within and across consumer groups. Simple ways to find out more about those elements are, for example, observing users while they experience your designed UX and have them narrate the process while they go through it. Like this, it is easy to realise how complex the experience really is and what feelings arise on the journey. In addition, asking the right questions will help to improve user experiences. Researchers should therefore be clear on what they want to find out and if they really want to know the answer(s). 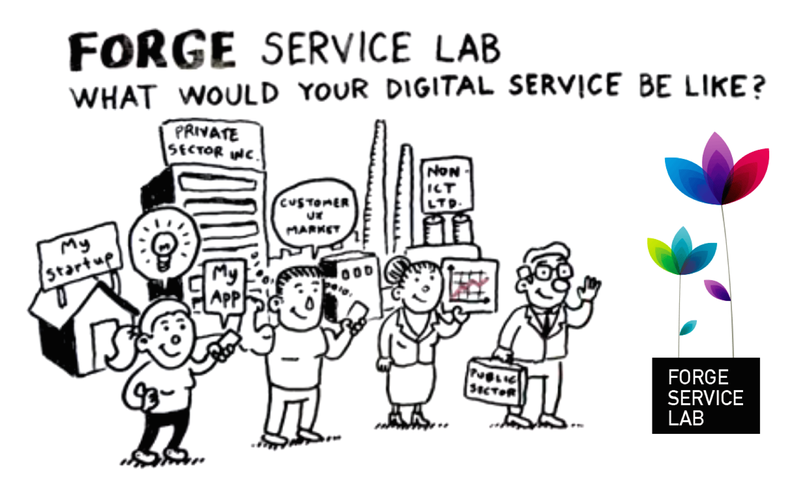 The course New Service Development and Innovative Business Models brought us first real life experience in service innovation and design by working in groups on an existing service concept offered by FORGE Service Lab. FORGE, mothered by Digile, is a non-profit accelerator for digital service creation with the ultimate goal to assist boosting the internationalization of Finnish companies. Being still a young business, FORGE asked for our ideas to validate or challenge their value proposition and how to strengthen the role of Service Design in their offering. At first, our team struggled with what seemed to be a very vague service idea and to fully understand what FORGE actually wants to offer to what kind of customers. A lot of time was spent trying to shed more light onto this by discussions within our group and together with a FORGE representative. None of this seemed to move us forward. In retrospect this was a good thing – working in service design, this will be a standard situation one should embrace in order to let creativity run free without getting caught up in trying to figure out everything in the very beginning of the process. In conjunction with the course Deep Customer Insights through Ethnographic Research our team set out to conduct interviews with potential FORGE customers or organizations that could help bring more clarity to the needs of Finnish companies when it comes to developing digital services. We individually interviewed a technology company, the City of Helsinki, a luxury watch manufacturer, a representative from hospitality management, and a co-housing company. Even though the interviews mainly brought us insights speaking against the need for a service like FORGE’s, we took this as a great starting point to find ideas on how to improve the offering, starting from the value proposition. A great help in this was working with CoCo Cosmos and simultaneously with the service logic business model canvas. Through CoCo we managed to create a clear service flow from a company’s idea for a new digital service, their need to validate this idea and to find the right partners to develop it further, until commercializing the now existing new digital service. The service logic business model canvas help us to figure out the “what’s really in it for me” part from customer perspective. Visualizing the digital service development journey via CoCo enabled us to realize that there are different building blocks and the thought arose that customers should be able to pick the blocks they need and drop others. In addition, we realized that a FORGE customer does not just want to develop a digital service. The customer wants to find out if this digital service will bring profit in the end. We took this point as one of the main items used to develop FORGE’s offering and value proposition further. After presenting our enhanced service concept and value propositions, we received additional feedback from FORGE and based on that finalized our proposal for them. 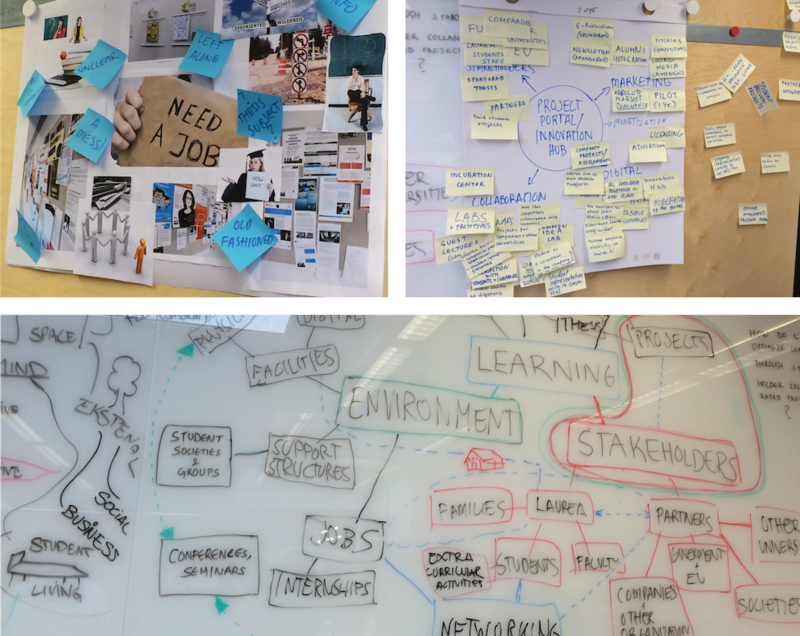 This concluded our journey through a real life service design project from an fuzzy starting point to conducting interviews over to using service design tools to bring order to the still fuzzy chaos and to finally uncover a service flow with room for improvements. What studying service innovation and design has taught us so far was confirmed during this hands-on experience with FORGE: There is always room for improvement and service companies should welcome this fact to keep evolving and growing. Ojasalo, K. & Ojasalo, J. 2015. Adapting Business Model Thinking to Service Logic: An Empirical Study on Developing a Service Design Tool. In Gummerus, J. & von Koskull, C. (eds.) The Nordic School – Alternative Perspectives on Marketing and Service Management. Helsinki, Finland: Publications of Hanken School of Economics. (in print). The ability to design is undeniably an essential part of human intelligence. Everyone is a designer. Just like everyone is capable of creative thinking. We may not be equally talented at it but using Design Thinking tools can amplify our chances for success tremendously when working on tasks or problems at hand. Over the span of the two-day intensive Design Thinking course taught by experts of the field Dr. Katja Tschimmel, Design Professor at ESAD Portugal, and Gijs van Wulfen, Innovation Consultant, I was exposed to some already familiar Design Thinking tools as well as completely unfamiliar techniques I had never used before. The course emphasized the importance of visual triggers and sensations for our idea developing process and collaboration within your design team. Collaboration is known to be especially fruitful when the team members have diverse backgrounds and are experts in different fields (Brown, 2009), which put us into a perfect setting for our hands-on group design project carried out as part of the course. Working through the different stages of a service design project within a diverse multi-background team also presented the already familiar tools in a new light to me – as being much more applicable in a business environment than I used to think before. Especially to my liking among the previously unfamiliar techniques and something I will definitely adapt to my professional life are visual and semantic confrontations, part of the group of tools used in idea generation and experimentation (Tschimmel, 2012). Combining and connecting unrelated things with each other can lead to very unique and new ideas. This technique reminded me of a quote by David Byrne from his book Arboretum: “If you can draw a relationship, it can exist” (Byrne, 2006). The creation of relationships and links between so far unrelated things can be an ideal source for new innovations and is therefore a very good starting point for any design process.